It’s the typical Ladybird book image: Daddy with a saw and Mummy with an apron and a baking tin and it can often catch people unawares to see anything other than this, even though the family dynamic is a constantly changing thing. I had firsthand experience of this recently. My husband is much better at housework than I am but I’m (affectionately) known as “DIY Donna”. So when David left to go to work recently and the door was sticking, I grabbed my rasp and file and set about fixing the problem. And boy didn’t I get some strange looks! Granted I was wearing yellow pyjamas with little pink pigs on and a pink towelling robe but I can’t help but wonder if a man in a dressing gown would have been met with quite the same incredulity. 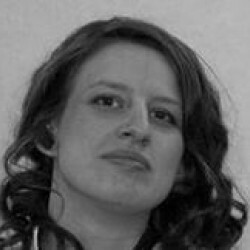 I have to say, I’m not remotely maternal in the conventional sense (i.e., unless the children in question are furry with paws) so I couldn’t compare my own experiences of parenthood but I have faced stereotypes myself: I’m a woman so I must want children. I have six cats so they must be child substitutes. I’ll reach a ‘certain age’ and suddenly my biological clock will kick in. All poppycock, of course, so I was interested to read The Myth of Mr Mom to read about the writers’ experiences of facing – and hopefully overcoming – gender stereotypes of a different kind. 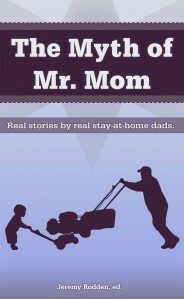 There are eight stories in The Myth of Mr Mom and surprisingly each one is quite unique, something Jeremy Rodden himself comments on in the afterword. These stay-at-home-dads or stay-at-home-pops (and my word even their abbreviations of SAHD and SAHP seem to start them on the back foot) have faced many similar scenarios or battles but each has started from a different point and approached their journey in a different way. There were two stories that really stood out for me. One was a very humorous tale from Christian Jensen (“Mr Mom: A Retrospective”), which amused me greatly but also underscored my reasons for not wanting to be a mother. (Sorry Christian: I’m guessing that wasn’t your main aim!). I say that because there’s a clear and evidenced love for Jensen’s children evident throughout the essay, despite the dry wit and sarcasm, which made it very touching but also made me very aware that I wouldn’t have the patience or compassion to take on his role! The other story that touched me was “Little Pink Umbrella” by Charlie Andrews. It touched me because I loved the idea of the father who stands, quite willingly, on a corner with a little pink umbrella, waiting for his daughter. Of course, there is a much more to the story than that but it stopped me in my tracks. My own father did many things for me that I daresay didn’t fit with his 'conventional role' but which he did for my sake. This is the aspect of fatherhood that often goes unrewarded or even unacknowledged. We joke about man flu or the father who can’t even get a diaper on. We assume that a man with a baby is stepping in or has been ‘lumbered’ for the day (my great maternal instincts kicking in again there!) but actually we often do ‘fathers’ the same disservice that women as a whole were done for many years. We make baseless assumptions about their validity and societal value, their roles and responsibilities and most of all, who they are. If The Myth of Mr Mom had a flaw for me, it’s that I would have liked to read an essay from someone much older who had really had to fight against the norm, not just of recent decades but an earlier, stauncher and perhaps more judgmental time period. Not that the stories contained are not inspirational but I think that would have added an extra dimension for me. However, Rodden mentions a potential second volume so perhaps this is a tale yet to be seen. I have made this a ‘Christmas Pick: For Dads’ because I don’t think you need to be a Stay-at-Home-Dad to enjoy it. In fairness, I don’t even think you need to be a male to enjoy it. However, I do think it will resonate with loving fathers because the key thing that links all of these stories is fatherly love and bundles of it. Buy this for your father and show them not only that you love them but that you love the love that they gave you and that every sacrifice – large or small – has not gone unrecognised. Note: I received a copy of this book in exchange for a fair and honest review. I did not receive any additional compensation.